There is just one Swartzentruber Amish community in Pennsylvania, and it looks like they will soon be gone from the state. This article reports that one family has purchased a home in the Watertown area of New York, while a land agent in Jasper, NY is seeking Amish buyers and/or renters. I have also heard that families are moving to the Heuvelton, New York community on the Canada border. Apparently the Empire State is a more attractive bet for Swartzentruber Amish these days. Swartzentruber Amish can be found in significant numbers in both New York as well as in Ohio, where the group emerged following division during the 1910s. Pennsylvania, the state between the two–and the one having the longest and most prominent connection to the Amish–will no longer have a Swartzentruber presence. Assuming the exodus takes place, will Swartzentruber Amish ever return to PA? Well, who knows. I do think this kind of story makes an impact. The narrative becomes “they tried and it didn’t work there”. Pennsylvania also doesn’t have much of a history of Swartzentruber settlement (beyond this community I don’t know of another). Swartzentruber Amish have encountered legal conflict in other states (including New York). But having a long-established footprint gives a certain security in the decision to move somewhere. Swartzentruber Amish have been in New York since the 1970s, with hundreds of families living in the state. Who are the most conservative Amish in Pennsylvania outside of the Swartzentrubers? Most likely the Nebraska Amish of Mifflin County. Though if anyone knows of similarly conservative PA Amish churches I’d be interested to hear (the state has over 50 settlements). Rich would this be the same community then? Ebensburg looks to be in Cambria County like the Nicktown referenced in the article about this settlement. The settlement is described as “north of Ebensburg” which would put them in the direction of Nicktown and thus in the vicinity of Indiana County which is the next county over. After I read your comment I realized I wrote “Marion County” rather than Cambria County in the post above (now fixed). Not sure how that got there…there is no Marion Co in PA (whoops). Sorry for any confusion. Erik, There is a growing Swartzentruber Amish group in Northern Maine, Better known as Down East Maine.Of the 5 communities in Maine, one of the communities is Swartzentruber. Check it out. Rumors have it, 600A sold in nortern Maine Last week. The land is being divided up among six families from a extremely conservative sect of the Amish……Near Hodgdon, Maine. Sincerely, Peter M. Johnson Tel.#(978-701-7693)Keep up the great work!! Erik, There is a growing Swartzentruber Amish group in Northern Maine, Better known as Down East Maine.Of the 5 communities in Maine, one of the communities is Swartzentruber. Check it out. Rumors have it, 600A sold in northern Maine Last week. The land is being divided up among six families from a extremely conservative sect of the Amish……Near Hodgdon, Maine. Sincerely, Peter M. Johnson Tel.#(978-701-7693)Keep up the great work!! Is the Ebbensburg settlement the same as the Tyrone Settlement – I used to do work in Tyrone and seen a few buggy’s in Tyrone, the dress was similar to the Lawrence County Amish, don’t remember if the buggy’s had battery lights or not. There are moving to my state !! I know there are some Swartzentrubers around Clyde and Waterloo, New York. Knowing there are many Amish settlements in New York State, I am not sure who is where. Welcome to New York. The Amish south of route 31 between Clyde and Waterloo are Swiss Amish and those north of route 31 in the Clyde, Rose, Lyons area are Troyer Amish who moved from Conewango NY. Eli without drilling down heavily on the math, it does seem reasonable to me, for a couple of reasons. Swartzentruber Amish tend to have larger families (perhaps 1-2 more children) and higher retention than the “average Amish”, at least in recent times. “The Amish” as a whole are typically thought to grow at a doubling rate of every 18-20 years. Also, the 110 Swartzentruber congregations of today surely includes some congregations that are small, perhaps only a handful of families. To get a more precise figure you may need to go down to the family level. It should be interesting to keep track of them if/when they do move out of PA. I hope those of you in NY (and elsewhere, wherever they might settle) will keep the rest of us apprised of their situation. It seems doubtful that they’d move back to PA if “rules & regulations” there don’t change in their favor. They seem pretty strict. How “different” from each other are Swartzentruber settlements from one state to another (or even one church district to another)? Have THEY ever made changes as a result of living in a certain area? (It seems doubtful to me, but I’m no expert.) Do they consider Swartz. settlements (other than their own) as misguided or just plain wrong (as far as their beliefs,clothing, “plainness”, etc. goes)? Alice Mary to make a brief response, I think we might not see the differences but they certainly would. I once traveled with a higher-level Amishman through an area with Swartzentruber Amish from different groups, who pointed out the subtle things that I would not notice myself. There are something like 3-4 main Swartzentruber groups, and a number more of similar/related groups. The barriers in place due to differences in practice are real and affect the way groups and individuals relate to one another. Certainly a interesting story to follow. I wonder what exactly led to this decision. I once heard an old order Amish say to me that there is no pleasing a Swartzentruber.We were discussing the swartzentruber and the triangle issue that took place in Kentucky a short time ago.I am not sure exactly what he was indicating other than the Swartzentruber are not ones to compromise, which in my opinion can walk a thin line between being a virtue or a vice. Erik, when our daughter was in a hospital in Pittsburgh, we became friendly with a Swartzentruber Amish family from near Conneautville PA whose son was hospitalized in the same unit. Conneautville is in the upper left hand corner of Pennsylvania, quite close to the Ohio line. We corresponded with them until a little while after their son died, about six years ago. Is this Swartzentruber settlement defunct now? I still can’t quite figure out why more Amish groups or other Plain groups haven’t moved into a large, fertile area in Ohio, west of Belle Center ( with its New Order Amish, I believe ) and south of Hardin County ( Old Order Amish, that I believe I recently read has grown from two to TEN districts ). There are also Old Order German Baptists in the areas west of Troy and Piqua, I believe they’re near Covington; many of them rely on horse and buggy transportation. I wonder if parts of that land are now too developed, or if maybe the land is too costly. It just has long seemed ( to me ) an ideal area for farmers; and, maybe that’s why – the English farmers already there won’t sell! Barbin said, in the end, the Swartzentrubers are being true to their consciences, despite the best efforts of the government to accommodate their beliefs. “I remember going to the house that the judge met at … and the wife came out and said, ‘You’re going to keep me from going to heaven. Whose fault is it going to be that I’m going to hell?’” Barbin said. I beleive some Swartzentrubers are moving to my neighborhood in NC. They have no smv triangles or windshields on their buggies. Small group of around five families so far. That’s interesting, Tina. I had not known anything about that, but it sure sounds like you are right. 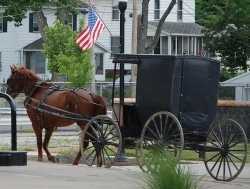 How are the local non-Amish people feeling about un-lit, unmarked buggies on the road? I live in a very rural area of NC and with only four or five families, we rarely see them on the road. I think the neighbors are just in the curious stage right now, no problems that I have heard of. There is a new settlement in Ellenboro, NC of Swartzentruber Amish. Five families currently – two from the Ethridge TN settlement; one formerly of Ethridge by way of Randolph MS and two from Mayfield KY.
We must live in the same community! Wander how five families from different areas came together to live in the Hollis/Duncan’s Creek/Ellenboro area? They seem friendly as they always wave every time I pass their house. I was just passing through Ellenboro this past weekend and two young Amish girls were selling soaps, lotions, and candles out of their buggy on the main road. I stopped and purchased some. They were very nice. Seemed very shy and reserved, but very polite. I will definitely be back to purchase more. It’s only about 45 min from where I live. I do hope that other people are buying their goods as well. I purchased and loaf of tomato bread and some peanut butter cups from an older lady and gentleman today. He said (with what sounded like a German accent) that there are 13 families in the area now. The treats are delicious. I admire them for sticking to their beliefs and way of life. O hope to learn more about them and how they treated here. We still stop for funearal processions here, and all the old folks drive slow, so a horse and buggy is no nuisance. I purchased some soaps from a lady today and I did not get a chance to talk to them I hoping to very soon. I see them out from time to time and the community seems to welcome them. My dad has had some conversations with them many times and he says they are very nice.